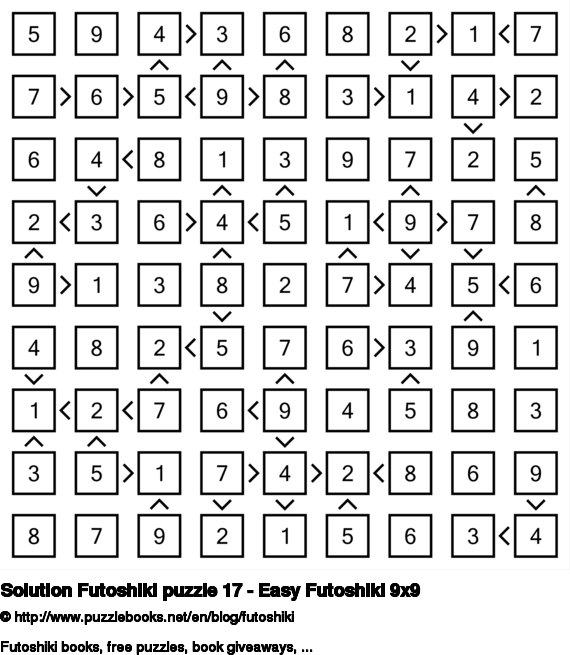 Click here to view the solution for Futoshiki puzzle 17 - Easy Futoshiki 9x9. I hope you managed to solve it and had a lot of fun trying to do so. Is solving Futoshiki puzzles an obsession for you? You will most certainly enjoy today's Futoshiki puzzle. How to play Futoshiki: The goal of Futoshiki is to place one number in each empty cell, so that each column and row contains each number exactly once. Some numbers may be given at the start. In addition, inequality constraints are specified between some of the squares, such that the number must be higher or lower than its neighbor. These constraints must be honored as the grid is filled out. 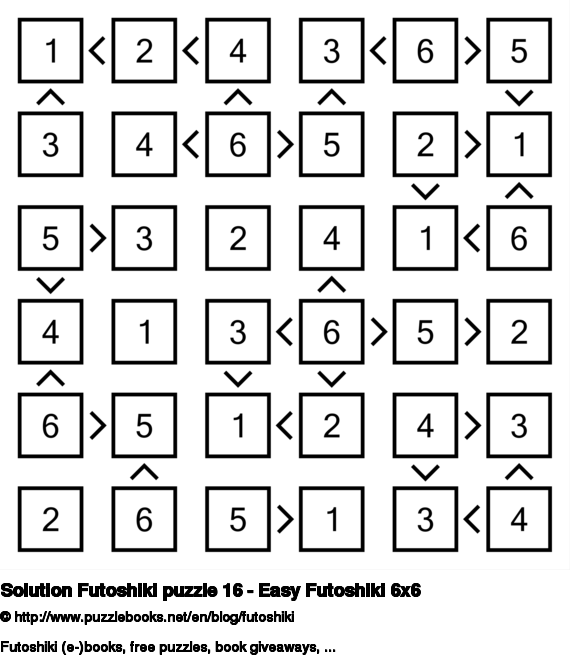 Click here to view the solution for Futoshiki puzzle 16 - Easy Futoshiki 6x6. I hope you managed to solve it and had a lot of fun trying to do so. Looking for free printable Futoshiki puzzles? You have come to the right place. Each week I post a new free Futoshiki puzzle that you can print and solve. 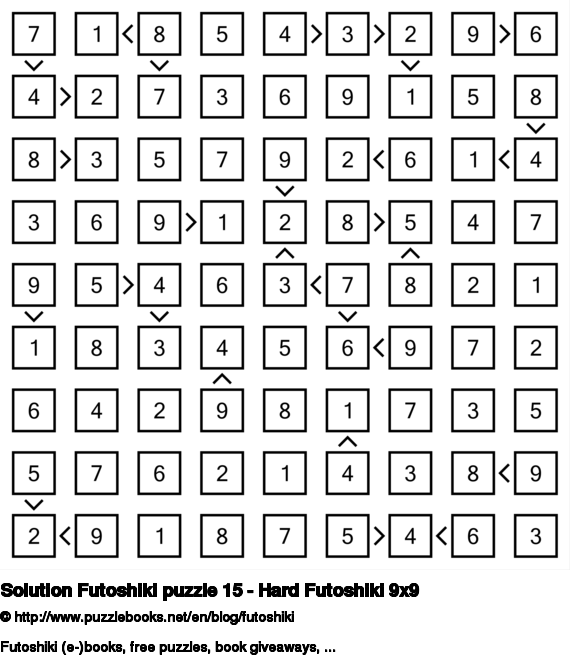 Click here to view the solution for Futoshiki puzzle 15 - Hard Futoshiki 9x9. I hope you managed to solve it and had a lot of fun trying to do so. 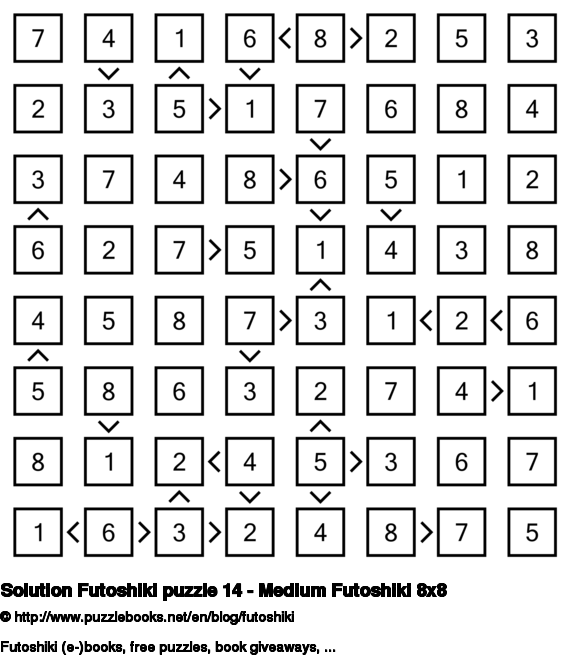 Click here to view the solution for Futoshiki puzzle 14 - Medium Futoshiki 8x8. I hope you managed to solve it and had a lot of fun trying to do so. Addicted to Futoshiki puzzles? Today I have another Futoshiki puzzle for you. Lots of pleasure trying to solve it. 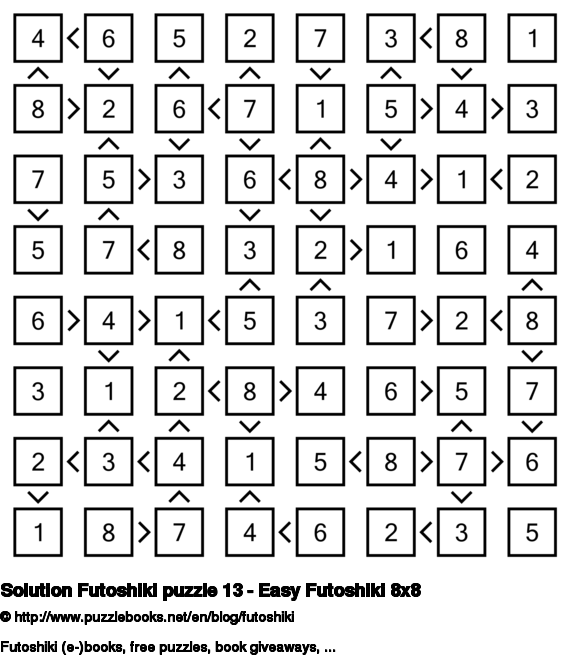 Click here to view the solution for Futoshiki puzzle 13 - Easy Futoshiki 8x8. I hope you managed to solve it and had a lot of fun trying to do so.